Got Questions? We’ve Got Answers! You can view the most commonly asked questions and answers below. 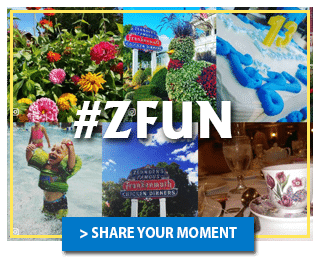 Does Zehnder's Splash Village Hotel and Waterpark offer day passes? Yes, half day passes are valid from 10 am to 3 pm or from 3 pm to 8 pm. Please click on our waterpark calendar for specific dates as our waterpark hours may vary. Waterpark hours are subject to change and we recommend that you visit our Waterpark Schedule for exact hours of operation. Does everyone need a pass to get into the waterpark? Yes, however, children under 3 are admitted free and children 12 and under must be accompanied by an adult at all times within the waterpark. What types of hotel rooms are available? We have a number of different room types to accommodate everyone. Our Dragonfly Rooms accommodate up to 4 with 2 queen beds and feature a microwave and refrigerator. Our Family Suites accommodate up to 6 guests with 2 queen beds and a full-size, pullout sofa sleeper. Family Suites have 2 televisions, a microwave, refrigerator and a fireplace. Our Loft Suites accommodate up to 8 guests, with the same layout as our Family Suites plus a loft with an additional queen bed and television. Our Majestic, Dragonfly and Parlor Suites accommodate up to 6 to 8 guests and include a microwave, refrigerator and 2 flat screen tv’s. What are the check in and check out times at Zehnder's Splash Village? Check in is at 4 pm and check out is at 11 am. You are welcome to use the waterpark from noon on the day of your arrival until 4 pm on the day of your departure. How many waterpark passes come with my room? Dragonfly Rooms come with 4 passes, Family, Dragonfly and Parlor Suites come with 6 passes, Loft and Majestic Suites come with 8 passes. One additional pass can be purchased at $20 per day. What kind of overnight packages are available? Two of our most popular packages are our Eat and Sleep package, and our Splashtastic 2-night getaway package. Each of these packages includes our world famous family style chicken dinner at our flagship restuarant Zehnder’s of Frankenmuth. Click on the package link under Zehnder’s Splash Village to view all of our package details or call one of our operators at 1-800-863-7999. Deposits are required for hotel reservations during our peak seasons, as well as every Friday & Saturday. Please call 1-800-863-7999 to confirm deposit requirements for your dates of stay. Please carefully review your confirmation letter to make certain reservation dates, room style and room rates are accurate. Please call 1-800-863-7999 to make any changes or cancellations. Cancellations for all reservations must be received 3 days prior to arrival. All holidays such as Thanksgiving, Christmas break, and Spring break require a 1 week notice. Cancellations made after these time periods are subject to penalties up to the price of the room. Can children under the age of 18 sign up for Zehnder's Rewards? Yes, children under the age of 18 can join Zehnder’s Rewards by registering under a parent’s account. What do you get as a Zehnder's Rewards account member? Zehnder’s Rewards is an exclusive membership program designed to reward our loyal guests with special offers, discounts and frequent buyer points. In addition, we provide each of our reward members with one of our world famous family style chicken dinners absolutely free during the month of their birthday. Can I sign up for Zehnder's Rewards if I don't have an email address or access to a computer? Yes. However, we highly recommend obtaining an email address to receive all of the benefits that our Rewards program offers. If you do not have access to a computer, simply call us toll free at 1-800-863-7999 and we will assist you. If you still have any questions, please do not hesitate to send us a message or contact an agent at (844) 207-8259.